Kaua Kaikala, Devin Fulcher and Kurtis Chong Kee were shorecasting at Kipahulu, Maui on a day with perfect weather and water conditions. By 10 p.m., they had three omilu and one ulua on the rocks. Then, Kurtis took a massive strike on his pole that took him an hour and 10 minutes to land. When they weighed the ulua at Mama's Fish House it tipped the scales at 101 lbs. 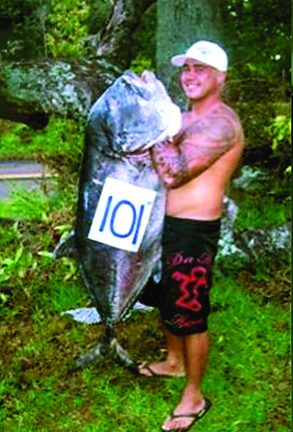 It was Kurtis' second 100-plus-lb ulua in two months!